Part of the Tarutao National Marine Park, Ko Lipe ticks all the boxes for many people’s idea of a perfect paradise island. But good looks often come with a price and a boom in tourism in recent years combined with some haphazard development has put pressure on this little island’s limited resources. Despite all of this, Ko Lipe is still undeniably pretty and enjoys a beautiful location in the marine park. With no traffic, soft sand, turquoise waters and hammocks swinging gently in the breeze, it’s easy to see why Ko Lipe has become so popular. The increase in tourism in recent years has resulted in more choice for visitors but has also resulted in an increase in prices. The three main beaches are Pattaya Beach, Sunrise Beach and Sunset Beach which all have a range of bungalows and resorts at varying prices. The compact size of the island makes it relatively easy to walk between the beaches and some of the better value places to stay on Ko Lipe are set back from the beaches in and around Walking Street, a small road lined with shops and restaurants that leads off Pattaya Beach and heads out towards Sunrise Beach. Ko Lipe is an island to soak up the sun and sea, but it’s also a good base to explore some of the other islands in the Tarutao Marine Park. If high season on Ko Lipe starts feeling a little congested, just hire a longtail boat for the morning or day and deposit yourself on one of the quieter nearby islands like Ko Adang, Ko Rawi or Ko Bulon to name just three. There are a number of dive operators based on Ko Lipe and some decent dive spots in the vicinity. In the evening there are plenty of places to enjoy food and drinks with beach-front restaurants and bars drawing the crowds. Cheaper local eats can be found in and around the Walking Street area. There is no airport on tiny Ko Lipe with the nearest airports on the mainland located at Trang and Hat Yai. 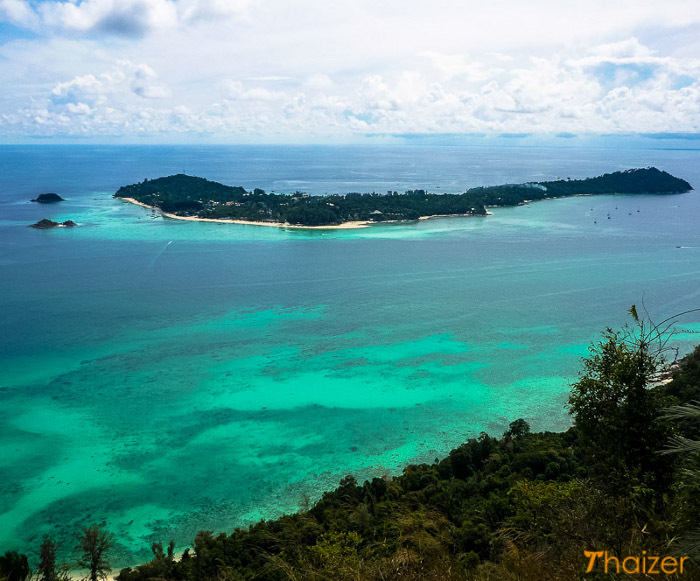 Low-cost airlines Nok Air and Air Asia both run flights from Bangkok Don Muang to Hat Yai or Trang which then connect up with ferry services to Ko Lipe. The all-in-one ticket price includes the flight and boat. Because of the shallow waters around the island, ferries and speedboats anchor off-shore and passengers are transferred by longtail boat. This isn’t ideal if you aren’t very agile although boat crew will usually help out as best they can. Longtail boats operate a shuttle service meeting ferries and speedboats as they arrive and transferring passengers to their chosen beach. The current charge (February 2012) is 50 Baht per person. If you are staying around the Walking Street area you should check with your guest-house or hotel to see if they arrange transfers. If they do, it will be in the form of a motorbike with a sidecar adapted to carry passengers and luggage. These taxis can also be hired on an ad-hoc basis if you need to use them to get you from A to B. If you don’t mind the exercise and your bags aren’t too heavy, from the longtail boat drop-off point on Pattaya Beach to the end of Walking Street is approximately a 10-minute walk.